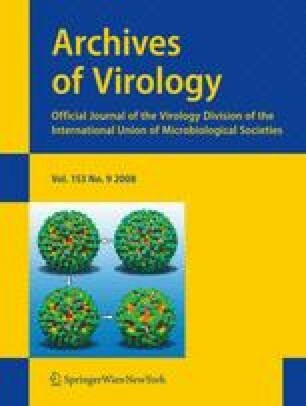 Genome sequence and characterization of a new virus infecting Mikania micrantha H.B.K. The complete RNA genomic sequence of a new virus infecting Mikania micrantha, designated as Mikania micrantha wilt virus (MMWV), has been determined. The genomic sequence and the predicted gene products of MMWV were similar to those of the other viruses of the genus Fabavirus. The MMWV nucleotide sequence showed 75.6% identity to that of gentian mosaic virus, 56.6 and 57% identity to those of two Broad bean wilt virus 1 isolates, and between 55.7 and 58% identity to those of seven Broad bean wilt virus 2 isolates. Our results suggested that MMWV represents a distinct isolate of the candidate species Gentian mosaic virus. The online version of this article (doi: 10.1007/s00705-008-0180-0) contains supplementary material, which is available to authorized users. This research was financially supported by the National Natural Science Foundation of China (No. 30670385) and the Key Program of the Ministry of Education of China (No. 403037).